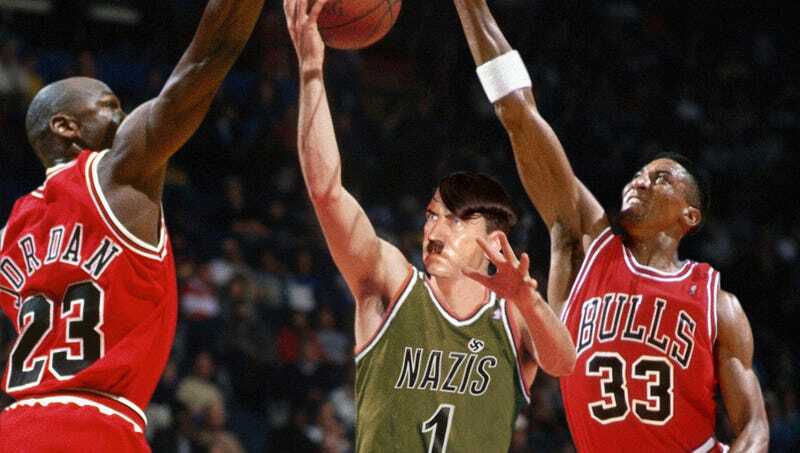 Nazi star and pure shooter Adolf Hitler repeatedly causes matchup problems for the Bulls during the first episode of One Thousand Rings. NEW YORK—Adding to its lineup an alternate-history drama that has been hotly anticipated by viewers and critics alike, the Showtime network will premiere an original series Sunday night that examines how the course of world events would have been altered if the Nazis had won the 1991 NBA Finals. According to press materials, the new show, called One Thousand Rings, explores what might have happened had a Third Reich team led by Adolf Hitler defeated Michael Jordan and the Chicago Bulls to take home the NBA title. The series reportedly depicts Phil Jackson’s Triangle Offense failing to withstand the strategic onslaught of Coach Heinrich Himmler’s Final Solution, which leads to the emergence of the Nazis as a basketball powerhouse in the early ’90s. Who’s to say whether Hitler, after becoming the NBA’s most talented star, would have even remained a Nazi? He might have joined the Suns and helped Charles Barkley win a ring. The producers of One Thousand Rings told reporters the pilot imagines what it might have been like for the legendary Chicago team to sweep Detroit in the East Conference Finals and then go on to the championship round to face the high-scoring Nazis and their infamous blitzkrieg offense. In the first games, they said, it appears the Bulls will easily handle the Third Reich’s renowned pure shooters, as well as its Übermenschen in the backcourt, Adolf Eichmann and Rudolf Hess. But as the Finals progress, no one seems to have an answer for Hermann Göring in the paint, and once Hitler starts to get into a rhythm from beyond the arc, the tide turns—an unstoppable tide that forever changes NBA history as we know it. Showtime executives confirmed later episodes will tackle issues that would have arisen in the wake of a successful Nazi basketball franchise, including whether, with the Bulls out of the picture, Dennis Rodman would have joined the Third Reich after leaving the San Antonio Spurs in 1995. Though Showtime has yet to renew One Thousand Rings for a second season, showrunner Brady told reporters he has already begun outlining how the series could go beyond the scope of the NBA to examine what the broader culture might have looked like during the reign of a Nazi basketball dynasty. He remarked that he would like to portray a world in which the bombastic Hitler, instead of Jordan, becomes basketball’s global ambassador, appearing in commercials for McDonald’s, Hanes, Chevrolet, and Rayovac batteries.